I must declare that I am not a great fan of the current balance that Team India has got in its ODI Team. Having said that, I do believe that the ODI teams’ balance has improved substantially over the last 8 months or so, thanks to the return of Irfan Pathan. I do believe that the return to form of Irfan Pathan is a definite positive for Indian cricket. After struggling with his rhythm for nearly a year, the young Irfan Pathan looks good today. He is running hard and bowling consistently in the mid-130kmph range. He also uses the slower ball and cutters quite effectively in ODI games. Throw in his competent batting and what you have is an effective package. Add to the mix the fearlessness of his captain M. S. Dhoni to use him in various different roles and you have the makings of an effective team-balance. However, I do believe that India needs another Irfan Pathan to achieve that elusive balance. If nothing more, this other allrounder could play when Irfan Pathan is either rested or injured. With Andrew Symonds and James Hopes in its ranks, Australia has that balance. In Sundays’ game against India, Hopes had a tight hamstring and sat out the match. The result was there for everyone to see. The Indians knew the 5th bowler weakness in the Australian team and so, waited for Michael Clarke and Andrew Symonds to be wheeled in! The presence of James Hopes would perhaps have altered their approach a bit. Similarly, in a tight game, I do believe India will get “found out” through the absence of that 5th bowler. At the moment, the team is making-do with a combination of Sachin Tendulkar, Virender Sehwag and Yuvraj Singh as that 5th bowler. Over time I do believe that the team needs to invest in another “allrounder” to achieve that elusive team-balance. In Praveen Kumar, India has one such candidate warming the benches in Australia at the moment! I do believe that he ought to get a game against Sri Lanka today. Other potential candidates include Yusuf Pathan, Joginder Sharma, Rajat Bhatia, Abhishek Nayar, although Manoj Tiwary, and S. Badrinath have also put their hands up, claiming to be allrounders! Over time, it will be, I believe, players like these that will make up the core of a ODI team. There was a comment in another thread by one of our regular readers that M. S. Dhoni’s response was “useless and arrogant” when he replied “I go by instinct” when asked why he chose Manoj Tiwary in the first game of this CB series. In my view that was a perfectly valid answer. I thought he would have been arrogant if he had said, “Well I knew he would struggle and scratch around. I knew he would duck to a Brett Lee bouncer in an ugly way. I knew he would be bowled off a terrific yorker. And in any case I knew that the game would be rained out and so I decided to chose Tiwary.” An even worse answer to why he chose Tiwary would have been, “The boys are all very well-prepared. The boys have all trained very hard for this excellent series. The boys are raring to go in this wonderful series against the World Champions. There is a real good feeling in the dressing room where we back each other. The boys are enjoying themselves and we are taking each game as it comes.”, a Mohammed Azharuddin type answer that says a lot and yet, says nothing! I certainly do not see that as arrogance. I see that as honesty. What you see from this guy is what you get. He has not stayed long enough in Mumbai, Chennai, Bangalore or Delhi to know a coat of sugar from a coat of paint! So this is long overdue honesty in Indian cricket, in my view. May his tribe increase. I certainly do not want sugar-coated platitudes that take no one anywhere. If one had perfect information, one can make the best choices. Otherwise, decision-making is about gut-instinct. Today, weather-permitting, a young Team India takes on Sri Lanka in the CB pyjama circus at Brisbane. While India fared much better than the Sri Lankans in the Test series against the mighty Australians this summer, the ODI game is a different ball-game altogether. In that sense, India will be chasing the eight-ball in this series; India is playing against the World Cup Finalists and the runner-up! Sanath Jayasuriya has recovered after being hit on the chin in a tour game in Hobart and Muralitharan has recovered after having had egg thrown at him after the game! Team India needs a fit Yuvraj Singh to take the field. In his absence though, India is likely to persist with Manoj Tiwary, a batsman who can bowl a bit — and that’s where Dinesh Karthik or Suresh Raina may miss out. I feel that bowling allrounder like Praveen Kumar might be a better choice though. In a few days from now the pyjama stuff starts with the Twenty20 game at the MCG on Friday 1 Feb 2008 between Australia and India. The Australians have lost a few Twenty20 games on the trot to India and will be gunning for the visitors. There is no love lost between these teams. With the recent downgrading of the racism charge against Harbhajan Singh, there will be much more at stake than just the game. The Australians will want to win badly. The Indians will not have four of their five senior stalwarts. Anil Kumble, Rahul Dravid, Sourav Ganguly and V. V. S. Laxman will have departed. In their place, we have a few fiery youngsters from the “New India”. They have said, even before the opening salvo has been fired, that they will fight fire with fire! Robin Uthappa has said that he would “give it back if the Australians sledge”! We live in interesting times! We are set for a cracker of a game and a cracker of an ODI series after that! If Yuvraj Singh is injured, I’d think that India would find it hard to beat Australia at the MCG. I suspect Sachin Tendulkar will sit out the Twenty20 game. One thing is certain. With the likes of Yuvraj Singh, Robin Uthappa, Suresh Raina, et al, in the mix, the visitors’ fielding and the running between wickets is certainly going to be much better than what we have seen in this summer thus far! Hopefully we will be entertained. Hopefully we will see no new controversies. Hopefully the cricket will be memorable for the right reasons. As I watched the Indians bats, and bat beautifully I might add, something started bothering me. 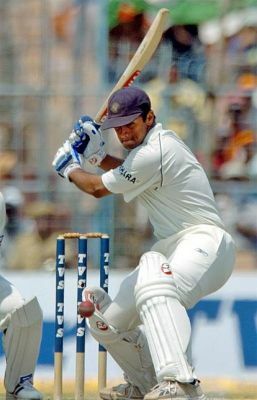 The foursome who scored so well in the innings include two genuine stroke makers in VVS and Ganguly, one God, and the other possibly one of the best anchors in test cricket in Dravid. The other two batsmen in the side include Wasim Jaffer, a stroke maker first and an anchor next (all left to chance) and Yuvraj, who believes that he is a genuine stroke maker. The three players who have been floated on this website and elsewhere as possible replacements include Manoj Tiwary, S. Badrinath and Suresh Raina all of whom are stroke makers. S. Badrinath, one may argue, has the potential to play the anchor role but I am not convinced as yet. By memory I think of Amol Mazumdar, Venugopala Rao, Mithun Manhas, Sitanshu Kotak, Akash Chopra, C A Pujara, and SS Das as ones who are currently playing domestic cricket and have had success in the anchor roles. Unfortunately, some of the mentioned players are considered past their prime (age), do not have the necessary clout, or are best in domestic outings but do not have it in them to take it to the next level. Mohd. Kaif has an outside chance but may still not have the technique to fulfill the role which brings to mind the key factor that, I believed is required to be in consideration. Technique! How many players in the current domestic playing circuit can boast of a technique any close to what Dravid or Tendulkar had when they came into reckoning? It would be interesting to hear others’ views on this but, for me, in addition to grooming the likes of Yuvraj, Raina, Tiwary alike, we have to more urgently start looking at identifying and nurturing players who can bring stability and solidity to the opening and middle order slots in the Indian batting line up. Rest of India won the Irani Trophy season opener convincingly. In Mumbai’s first innings, Kukreja (110 off 210 balls) and Abhishek Nayar (118 off 108 balls) scored tons to get Mumbai to a decent total of 453 all out. Abhishek Nayar is shaping up as a really useful allrounder to watch out for in the future. He bats left handed and is a right-arm fast medium bowler. In this match, Nayar bowled more overs than any other Mumbai bowler. Not that this fact alone counted for much in the end, but it talks of the confidence that the team has in this 24-year-old! After a shaky start in response to this large total, RoI responded soundly, with Parthiv Patel (179 off 235) and Manoj Tiwary (130 off 184) scoring brisk centuries. Parthiv Patel opened the innings with Akash Chopra and has been in stunning form with the bat! In the end, RoI had a slender 1st innings lead. Badrinath had made 29. It was around this time that news may have leaked of Badrinath’s impending selection in the India team. He may have hoped for the Irani Trophy match to get over soon so that he could pack up is kit and join Team India! But even Badrinath, — who commented, “I can’t leave till this match gets over. I hope we win it tomorrow.” — would not have expected the swiftness of the RoI victory! In the second innings, Mumbai folded for 106 off 33.3 overs in a mere 166 minutes! RoI had to make 90 to win, which they did for the loss of only 1 wicket! Parthiv Patel smashed a 48-ball 59 to continue his dream run with the bat. Parthiv Patel will continue to put pressure on Dinesh Karthik for a place in the team, especially since Patel is opening too! For Manoj Tiwary, this century represents a timely reminder to the selectors that he can’t be forgotten. Mohammed Kaif continues to be the most successful representative captain who probably didn’t play much for his country! Ramesh Powar didn’t make any impression on anyone! Ajit Agarkar continued to bowl like a millionaire that he is not. Young Iqbal Abdullah continues to impress and so does Pragyan Ojha. But most interestingly, after an insipid first innings, Munaf Patel bowled with fire in the 2nd innings for RoI. His 5-for-25 off 7.3 overs wrecked Mumbai and caused them to crumble to 106 all out (and his fighting partnership with Ranadeb Bose in the RoI 1st innings to take RoI to a lead will perhaps help his cause too)! Ps: Who is Omkar Gurav? What happend to Vinayak Mane? EDIT: Vinayak Mane is injured. For a few months now, I have been following the exploits of the India ‘A’ team captained by Mohammed Kaif. After impressive showings against Zimbabwe Select, Kenya and Sri Lanka A, the team continues its good showing against a South Africa ‘A’ side that includes many players that have turned out for the Springboks national team in the past. While India ‘A’ includes Mohammed Kaif (13 Tests, 125 ODIs), Parthiv Patel (19 Tests, 14 ODIs), Ishant Sharma (1 Test, 1 ODI) and Suresh Raina (36 ODIs) as players who have donned India colours, South Africa ‘A’ includes Morne van Wijk (5 ODIs), A. Petersen (2 ODIs), Gulam Bodi (2 ODIs), Boeta Dippenar (38 Tests, 107 ODIs), Albie Morkel (12 ODIs), Justin Ontong (2 Tests, 21 ODIs), Thami Tsolekile (3 Tests), Vernon Philander (5 ODIs), Johan Botha (1 Test, 13 ODIs), Charl Langeveldt (6 Tests, 48 ODIs). India won the 2-match Test Series 1-0 (one match was rained out). The first 2 ODIs were completely rained-out. In the latest ODI, India beat South Africa by 1 run off the last ball in a thriller at Rajkot. S. Badrinath continues to impress with both bat and ball and in my view, it is only a matter of time before this exciting 27-year-old dons India colours. He is a valuable bat, an electric fielder and a competent off-spinner too. For sometime now, I have been saying that India really needs a few good allrounders in its ODI make up. While welcoming the return-to-form of Irfan Pathan, I have been dismayed with the selectors’ reluctance to invest in Joginder Sharma for the ODIs against Australia. This after captain M. S. Dhoni had invested his reputation as well as India’s fortunes in the T20 Championship in two of the biggest last overs an Indian has bowled in international cricket! Here is a quote on Joginder Sharma from Dileep Premachandran’s article on Dhoni. His treatment of Sharma in the two biggest matches of the tournament summed up his qualities as captain. You or I could toss the ball to a Wasim Akram or a Curtly Ambrose and calmly watch a match clinched in the final over. It requires no great leadership quality or tactical nous. The real test of captaincy lies in bringing the fringe player into the centre circle and making him feel that he’s not a misfit there. It’s almost certain that no other Indian captain of the last decade and more would have dared go with Sharma for those final overs. By doing so Dhoni was emphasising sport’s greatest but often forgotten truth – it’s not about the stars, it’s about the XI. And sometimes the unlikeliest ones shine brightest. And after that bold and forthright statement, and especially when an opportunity persented itself with Piyush Chawla’s freak injury, Joginder Sharma has been cast to the sidelines. I have been following the careers of allrounders like him and Praveen Kumar, the 20-year old allrounder from UP. He plays alongside R. P. Singh, Piyush Chawla, and Suresh Raina in the UP side. He is a carefree bat and an opening bowler. He opened the batting and bowling in yesterdays’ game. Although he didn’t make much with the bat, he bowled well — including the last over of the match. I do believe that Joginder Sharma and/or Praveen Kumar should play for India in ODIs soon. Just the presence of Irfan Pathan does so much for team balance. This balance will be augmented by the presence of another allrounder and I will continue to pay close attention to the progress of both these contenders. All through these matches, Parthiv Patel has been thoroughly impressive. He has notched up several 100s and 50s and his ‘keeping has also been quite ‘tight’. Mohammed Kaif, who scored a smart 98 in yesterdays’ match continues to impress with his captaincy and may end up being the best U-19 and India-A captain that didn’t get an extended stint with the national team! Suresh Raina made his first appearance yesterday and scored a compact 45. Amit Mishra, the young leg-spinner, has had a few good games too. After bowling with aplomb in the Test match, he also scored a breezy 22 off 11 balls in yesterdays’ ODI. The one disappointment through this tour is that bowlers seem to have worked out Manoj Tiwary’s weakness against the short-rising-ball. He is getting peppered with the short stuff and the young dasher seems to be hell-bent on rewarding the bowlers’ efforts too! Given the recent comments on this blogsite on my original post on this topic, below is a fuller list of potential India-A players.